"It's not ancient tribal burial grounds, just... people." Growing up in the ‘80s, I wasn’t a daring movie watcher. To put it simply, horror movies frightened me. Even PG films like Poltergeist were spooky enough to give me nightmares. We started watching the Tobe Hooper film at a friends’ house on VHS a few years after its 1982 release. I was probably around eight and not ready for it. Once the chairs started moving and the tree came to life, I was out of there. I went home before the real chaos began, and that was definitely a wise move. I’ve seen glimpses of scenes on TV since, including a creepy clown and famous shots of Heather O’Rouke saying “they’re here” as young Carol Anne Freeling. Even so, I’ve never sat down and watched the complete movie. Part of me is still wary after that first experience; childhood fears don’t ever really go away. Commercials on TV have started airing for the new remake, which hits theaters in May. I’m not thrilled to see it, but the brief glimpses of a clown (again) and other iconic elements are still creepy. On the other hand, I doubt it will leave much of an impression. The trailer offers glimpses at the iconic moments of the original, yet feels strangely distant. It’s possible the genre has changed too much to make this premise click. Sam Rockwell and Rosemary Dewitt should help to sell it. I’m getting off track, however. We’re here to talk about the original, which Hooper directed with considerable input from Producer Steven Spielberg. There have been hints that Spielberg did more than Hooper to really guide the project. Regardless of the real creative source, the movie worked for audiences. It’s time for me to finally put aside the fears that have caused me to avoid Poltergeist for more than 30 years. The story is set in the type of new house community that was common in the early '80s. In fact, my parents moved us into a similar neighborhood in 1982. Our house was right next to a cemetery; is my reluctance to watch it making more sense? Despite the updated furnishings, the house where the Freelings live is really creepy. An ugly old tree stands just outside the kids' window, and an unfinished pool sits in the backyard. Steve (Craig T. Nelson) and Diane (JoBeth Williams) are well-meaning parents trying to raise three kids. They don't deserve to be haunted by ghosts. On the other hand, they're so laid back that the danger barely fazes them. The family witnesses unbelievable sights yet seem okay with spending another night in the house before moving. Carol Anne is abducted and disappears, but her parents (especially Diane) often forget that fact when marveling at the ghosts. Part of the reason is the requirements of the script; if they'd bolted when the chairs started moving, the movie would end. Plus, we'd never get the chance to meet the great Zelda Rubenstein as the ghost expert Tangina! 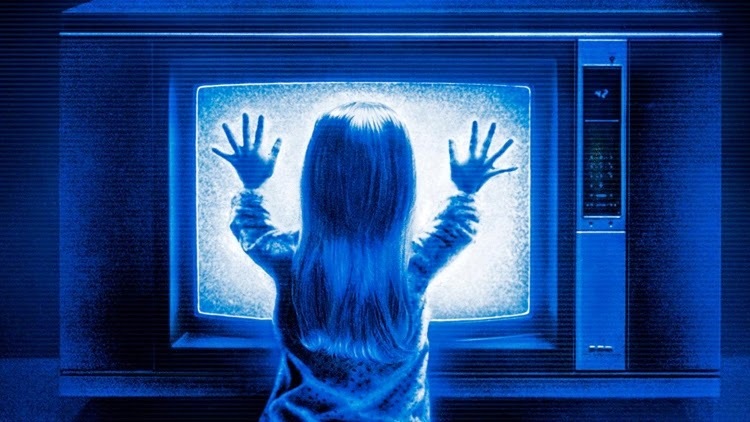 I didn't have nightmares after watching Poltergeist, but that doesn't mean it isn't scary. One scene with a guy imagining the skin on his face ripped off is grisly. The clever use of make-up brings a different level of creepiness than modern effects. The use of sound also makes an impact when there's little happening on screen. Just hearing Carol Anne's voice from another dimension brings a chill. The pace is fairly slow, but it ratchets up the tension. The quiet before the chaotic finale is quite effective. We know that everything is not okay and keep waiting for something to happen. There's a fine line between scares and silliness, and this movies strikes that balance. A toy clown trying to choke young Robbie (Oliver Robins) is funny; Diane getting attacked by skeletons is more frightening. Most scenes have a little of both. The result is an odd hybrid between mainstream entertainment and horror. The tone shifts by scene and generally works, though the end result is a bit different than you might expect. This post is the March contribution to the Blind Spots Series. Check out all the entries on this page. Zelda Rubenstein as Tangina = all sorts of yes. I've loved this since I first saw it, probably in '82 or '83. The scene that's stuck with me is when they open up a bedroom door and everything is just swirling around like there is a tornado in there. Curious about the remake. I'll see it eventually, but I seriously doubt it will hold a candle to the original. I don't feel like the concept is terrible for a remake, but the trailer makes it look like they're trying to copy the big scenes. That could just be the marketing, though. I probably won't run out to see it, especially with the other movies coming out in May. Thanks Vern. It wasn't too hard of a viewing this time, but I can totally see why it would be scary to a kid. I saw this in the theater, and it's still a favorite. This is another of the great June, 1982 films that makes it one of the great mnoths of cinematic history. Seriously, some time go look up the films released that month. There are five classic sci-fi/horror films released in a four week period. Poltergeist is evidence that a good PG movie can be made with some real scares. There are some very scary scenes in Poltergeist that still work 30+ years after the fact. That is such a crazy year. I knew that Star Trek II, Blade Runner, ET, and The Thing were all close together, but there are so many more! Conan the Barbarian and the Road Warrior came out in May, and Tron came out in early July. All of these movies are still talked about today. Heck, Star Trek II came out the same weekend as Poltergeist. Crazy! I just watched this in full for the first time yesterday. Had only seen bits and pieces before. I enjoyed it as well, and I agree, there were some genuine scares in it. Nelson's "Lies! Lies!" freak out was a bit over the top, but oh well. Also can't believe this was rated PG. That skin peeling scene was so nasty! Oh man. I still can't believe that skin scene was in a PG movie! So nasty. It was a bit goofy at times, but it felt less polished in a good way too. I don't have high hopes (or plan to see) the remake. Thanks Alex!